Statistics show Burnley have played more long passes than anyone else in the Premier League. 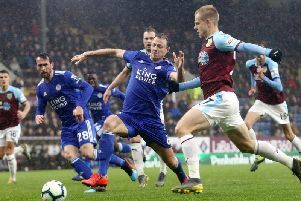 But Clarets boss Sean Dyche makes no excuses for his side’s brand of football, believing his players are more suited and more effective with that style. Burnley have made 2,361 long passes so far this season, with Newcastle next with 2,228. Champions Manchester City are bottom of the pile with 1,432 by comparison. Dyche has spoken time and again of his footballing nirvana - to play effective football, in a mixed style, looking, like Sir Alex Ferguson’s Manchester United at their peak, to hurt sides in as many ways as possible. His team was evolving last season, starting to retain the ball better, and the 24-pass move which led to Jeff Hendrick’s winner at Everton was a prime example. However, injuries to the likes of Steven Defour and Robbie Brady midway through last term hindered that progress, although Burnley still went on to finish seventh and earn Europa League football. "They both went 'the ball coming to me really quickly'. "It's horses for courses of course, we have a different way because, if I got my players to play how Man City play, it wouldn't be effective. "Our players are good at other skills. “Every player at City is £50m or above, and for good reason. "We've had to make a system that works, not just style or brand, to win, stay in the league, buy players at a certain level, wages at a certain level, develop and sell. "Those managers have to win. Still not easy, but different kind of management. In between leaving the Watford job in the summer of 2012, and taking the Burnley post in November that year, Dyche travelled to study clubs’ methods, but for all the methods he has observed, sometimes it is about simplifying, rather than over-thinking, the game. He said: "I studied loads of different teams, Valencia, Barcelona, but more the story behind the beauty if you like, or their habits. "Pep (Guardiola)'s doing it now, when he first came they were changing everything every week, which isn't really his style, and then last year, 4-3-3, virtually the same players played all the time, or a lot of the same players, and ran away with it. "Maybe, that was his learning curve, maybe he thought 'I've tried to tinker and I don't need to, I've got top players, give them a format, get them organised, make sure they work properly and appropriately and I think that was a genius moment in management. "Sometimes, to simplify it is hard. You're in the moment, I've always said the hardest thing in management is to do nothing. "Sometimes the hardest thing is to do nothing. Guardiola has long been considered an innovator, with a restlessness to find winning formulas. And while Dyche is an admirer, he feels innovation in modern football comes from the small gains, the extra percentages, in sports science, diet and analysis, rather than in systems and shapes. A keen student of the game, Dyche points out the cyclical nature of tactics, with most formations used at some stage or other previously in the history of the game: "The game's been going 140 years, Brian Clough was innovating 30-odd years ago, exactly what modern football is - it's all cyclical. "There's a great book Inverting the Pyramid, but basically, the 1938 World Cup Final, Hungary versus Italy, and basically both teams played 4-3-3. "4-3-3 is like a revolution now, but it's been there forever. "Until they change how many players play, the size of the goals, pitch, 10 substitutions...the format of the game is very similar. "It's the detail which is the difference. "Every year the details get crunched and crunched and crunched, the analysis, sports science, fitness levels, keep getting pushed. "Man City have definitely run more since Pep went in there, fact, Liverpool run more, Manchester United - not under Mourinho, but now - that is a brutal fact. "High talent, highly organised, running large amounts. "If you think that hasn't been there for a long time, just getting improved, it has. He points to an example over 20 years ago, pre-dating Guardiola’s inverted full backs: “Alan Smith at Crystal Palace...when I was at Chesterfield, John Duncan wanted Martin O'Connor, but couldn't afford him, and I was the makeweight, so I went to Palace for a couple of days and trained there. "Gareth Southgate was there...I always remind him and he remembers me, obviously! "But we were doing this drill, and when the ball was on the other side, could the full backs come inside into this deep midfield position? "I read about Pep Guardiola doing that two years ago, inverting the full backs, as if it was a masterstroke. "I'm not saying Pep learned from Alan Smith, but there's that many things that happen in a game , they have all probably been done, or a version of them. "I witnessed it with Brian Clough, two centre halves split, full backs get high and wide, midfielder comes and gets the ball, the other midfielder stretches the pitch, Nigel (Clough) coming off in the 9.5/10 position, striker stays long as an out, wide man rapid, the other coming inside. "If that's not as modern as any football plan, I don't know what is. "The best one was Wenger, he got an old school format, 4-4-2, and slowly morphed it into Arsene's beautiful football. "You watch his early years, not much beautiful football. Get it forward early to those two, Bergkamp and Wright. Why bother giving it here when you have those two up front? "Get it to them as quickly as you can. Brian Clough did that, Sir Alex, make no mistake.